Sandeep Satratey had the most liked content! Dish type shape helps to produce swirl and squish in the air-fuel mixture for complete burning of the fuel that results in increased volumetric efficiency and reduced detonation. It also provides clearance so that inlet and exhaust valves cannot touch the piston head at the end of the compression stroke. Centrifugal pumps rotate fluid, continue transfer momentum to the fluid and create centrifugal force through impeller blades so that it can continue flow in radially outward direction. Because of these properties, it is used where a continue large amount of flow at low pressure is desirable whereas reciprocating pumps positively displaced the fluid in a forward direction using reciprocating motion of the piston. It means if we stop the pump, there will be no reverse flow of the fluid. It contains suction and discharge valves that enables pump to create a high pressure in the fluid in cylinder during compression stroke so it is used where less amount of flow only in one direction at high pressure head is required and discrete flow has no any bad impact. Diesel and petrol engine both are internal combustion engine and have all four strokes - suction , compression , expansion (power) and exhaust, but there are some differences due to the way of burning. Diesel is less volatile than petrol and has higher self ignition temperature than that of petrol and diesel engine only compresses air, so diesel engines use fuel injector to atomize fuel and has higher compression ratio to ignite the fuel .We do not use spark plug in diesel engine because tiny spark produced by the spark plug is not sufficient to burn the fuel. On the other hand , Petrol is more volatile than diesel so it doesn't require high compression ratio and fuel injector because only tiny spark produced by the spark plug is sufficient to burn the fuel. 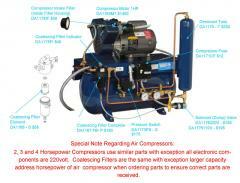 Why is capacity of air compressor measured in air flow unit like CFM , and Litre per hour ; and capacity of refrigerant compressor measured in heat unit like ton ? How much do we set dew point of compressed air that comes in direct contact with RH/ Temperature sensitive chemical powder in granulation process in pharmaceutical company where it is also used to operate some pneumatic valves and what's the ISO standard for compressed air filters?